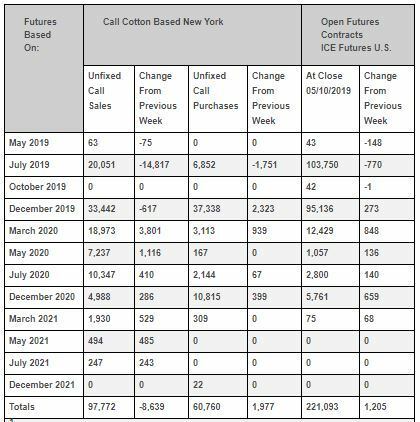 ICE cotton futures settled higher on Thursday as firm weekly export sales report from the United States Department of Agriculture reassured investors that demand for US cotton was robust. The most-active cotton contract on ICE Futures US July settled up 1.2 cent, or 1.6 percent, at 78.32 cents per lb. India – Physical prices traded steady last week on slow selling from ginners and slow emand from domestic mills. As per the latest CCI report, India’s current cotton crop arrivals reached 27.88 million bales until 16th April 2019. The Indian rupee depreciated against the US dollar and is now around 70.10 (spot), mainly due to surging crude oil prices. The cotton market was sharply higher Thursday as traders sloughed off so-so sales and exports data. Chart-wise the market had traded down to the last levels of support, and when it appeared early on that those lines would hold, shorts covered and bulls re-bought. US Weekly Export Sales Report on Thursday 02nd May 2019 at 6:00 pm IST.